EUROHISTORY 2015 USA subscriptions can now be purchased through AMAZON! We are working on being able to list the subscription for international readers/subscribers! 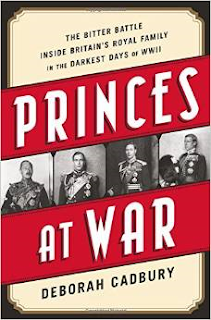 Deborah Cadbury certainly mined a lot of sources while researching Princes at War (Public Affairs: $28.99) a largely excellent book about the British royal family during the second world war. The book opens with the abdication of Edward VIII and the accession of his younger brother, the stuttering and untested George VI. It ends with George VI's death in 1952. The British Royal Family did not escape the from the demands of the second world war. The former Edward VIII, now the Duke of Windsor, and his American wife, Wallis Warfield Simpson, were not to be trusted as both were Nazi sympathizers, as official British and American documents have shown. The Duke of Kent, married to the attractive Princess Marina of Greece, was on active duty during the war, and killed in a plane accident, less than a month after the birth of their third child, Prince Michael. Shortly before the war, the Duke of Gloucester was named as Governor General, but his acceptance was put on hold until after the war. 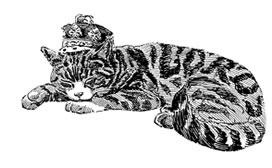 He provided important support to his brother, who sent him to war zones in the British Empire. The true burden of the war was felt by George and his family, as the bombs rained down on London. The king proved an effective monarch, able to advise and discuss with his ministers, including Prime Minister Winston Churchill. Cadbury is to be commended for concentrating on a specific historical period within the confines of British royal history. This was a difficult period for the United Kingdom - and for the monarchy as the King and other members of the royal family grappled with personal feelings and public demeanor. The king's two daughters, Elizabeth, heiress presumptive, and Margaret, spent most of the war at Windsor Castle, protected and safe from the war. It was Elizabeth, as she approached womanhood, who managed to carve out her own war role as a member of the Auxiliary Territorial Service. As German troops marched through Europe, invading, and taking control of most of Western Europe, several sovereigns and their families fled, and ended up at Buckingham Palace, including Queen Wilhelmina of Netherlands. England became the safe haven for European royals and governments in exile. I was impressed with the depth of Cadbury's research that led to a largely well-written and effective book. But I was saddened by the lack of attention to details about the royal family and their relatives. Page 60: impossible for the Duke of Kent and his brothers to have relatives on the throne in Hungary as Hungary was a part of the dual Empire with Austria, and the connection to the Habsburgs was light. The Austro-Hungary monarchy ceased to exist in 1917. Page 61: Princes Philipp and Christoph were members of the Princely family of Hesse-Cassel. Empress Alexandra was not the "most famous descendant" of this family. She was a member of the Grand Ducal Family of Hesse and By Rhine. Page 178: Prince Paul was one of three Regents for King (not Prince) Peter of Yugoslavia, who was approaching his majority. On this page, Cadbury described Peter as Paul's nephew. Peter was the son of King Alexander who was Paul's first cousin. Cadbury does get it right on page 190, when she described King Peter as the son of Paul's cousin. Page 208: It would have been impossible for Queen Elizabeth "preparing for her usual Sunday routine" on December 7, 1941, when she heard the news of the Japanese attack on the wireless. The attack was not announced on the radio on the US East Coast until nearly 3 p.m., which means the king and queen would not have learned about it until that evening, as London is five hours ahead of the U.S. coast.. Page 250: I am not sure I would describe Mafalda as Philipp's beloved wife. This marriage was largely an arrangement that was beneficial to husband and wife. Philipp was bi-sexual, and his homosexual relations continued after the marriage. After the wedding and honeymoon, Mafalda preferred to spend more time with her family in Italy than in Germany. Page 266: King Michael (not Prince) of Romania. His mother, Helen, was known as Sitta (for sisters) and not Zitta. Paul of Yugoslavia may have become depressed over events in Yugoslavia, but it must be noted that he, although a regent for the minor King Peter, did not himself have dynastic rights. 279: Kaiser Wilhelm's eldest son was Wilhelm (not Friedrich Wilhelm). He was styled as Crown Prince Wilhelm. One sentence on this page is totally confusing. "Their destination was Schloss Friedrichhof, a magnificent castle in Kronberg once owned by the George VI's aunt, Princess Victoria, which had passed to the Hesse family." Huh. Schloss Friedrichshof was owned by Empress Friedrich, widow of Friedrich III of Germany (parents of Kaiser Wilhelm II). Empress Friedrich was a British princess by birth, the eldest daughter of Queen Victoria. She was George VI's great aunt. Empress Friedrich left Friedrichshof to her youngest daughter, Margarete, who married Prince Friedrich Wilhelm, Landgrave of Hesse (and the parents of Philipp and Christoph). 279: Cadbury jumps the gun by stated that the Princes of Hanover were related by marriage to the Danish, Greek and Spanish thrones. Prince Ernst August of Hanover (1914), head of the family, was the grandson of Princess Thyra of Denmark, and the son of the last Duke of Brunswick and Princess Viktoria Luise of Prussia (the Kaiser's only daughter.) Thyra's brother was King George I of the Hellenes. Ernst August was not related by marriage to these families. He was related by blood. His sister, Frederika, married King Paul I of the Hellenes, a grandson of King George I, and their daughter, Sofia, married the future King Juan Carlos of Spain. This marriage did not take place until 1962, some years after the second world war. 288: Although the Red Army played a major role in liberating Belgrade, Stalin removed his troops from Yugoslavia in 1944. It was Tito's government that appropriated royal properties and possessions. Although I found these errors to be irritating, the average reader probably won't. What is more important is the scope of Cadbury's impeccable research, which focuses on the lives of the British royals and their roles in the second world war. The Duke and Duchess of Windsor do not come off well, but this does not come as a surprise as there is a growing body of historical documentation about their treacherous behavior. The abdication was an emotional and political upheaval that put the monarchy into question. King George VI and his family emerged from the dark days of the second world war, stronger, and more popular, and this is made clear by Cadbury's proficient text. Britain was lucky to have George VI as their king during the war. Looking for something royal to read? I am making my way through the pile of books on my cocktail table, and here are a few recommendations to read. Acclaimed historian Coryne Hall has turned her attention to princesses who worked as nurses during war and revolutions, writing a book, Princesses on the Wards (The History Press: L6.99)about the lives of a diverse group of royal women. It was calling of Florence Nightingale, who gave a brave and modern face to nursing that inspired two of Queen Victoria's daughters, Princess Alice and Princess Helena, to learn more about nursing. Nursing would bring new focus to the role of royal women as they rolled up their sleeves to take care of the sick and dying. For several royal women, this calling allowed a deeper appreciation for the nursing profession, thus allowing for the creation of programs to educate and train nurses for the late 19th and early 20th centuries. The royal women included Queen Marie of Romania and her daughter, Ileana, who ran her own hospital in Romania until the Romanian royal family was forced into exile. Other royal nurses include Princess Marie Jose of Belgium, Empress Alexandra of Russia, and my favorite, Princess Arthur of Connaught, a trained nurse, who ran her own nursing home. Coryne Hall accessed a myriad of sources -- and each chapter is chock-a-block with footnotes, which adds to the book's excellent value. For most of these royal women, the only real goals in life were marriage and motherhood (and consort), but their embracing of a new profession gave them -- and the nursing profession - a new gravitas. For the princesses, there were new, more important duties and an entirely different view of service. Kudos all around for an exceptional new, specialized royal book. Helen Azar, an American librarian, is a Romanov historian, focusing on the lives of the daughters of Nicholas and Alexandra. Her first book, The Diary of Olga Romanov: Royal Witness to the Russian Revolution, was published by Westholme Publishing in 2013. Since then, she has written two more books. The first book, Russia's Last Romanovs In their Own Words, which co-written by Eva and Dan McDonald. This paperbook offers a glimpse into the lives of the Russian Imperial family as seen through the memoirs of others, including the Captain of the Standart and Tatiana Botnik and correspondence and diaries of Nicholas, Alexandra and their children. In one of Alexandra's final diary entries, which her final month of life before the entire family was murdered at Ekaterinburg, she wrote about the heat, and how the "honeysuckle foliage is beautiful, but, as usual, not-well groomed." Ever the Empress. Some of the material was only available in Russian, and translated into English for the first time, which gives the reader new details and insight into the lives of these young woman. This is a valuable addition to the Romanov bibliography, another important source of information. I do wish the authors had used an editor to help them produce a more complete book. After completing work on Russia's Last Romanovs, Helen Azar began work on Maria and Anastasia The Youngest Romanov Grand Duchesses in Their Own Words, the companion to The Diary of Olga Romanov. The first thing that struck me about this volume is the ordinary and the dullness of the lives of Maria and Anastasia. They were Grand Duchesses, lived in palaces, and their father was the Emperor of Russia. Their own lives were so far removed from reality, even the reality that was the Imperial family. With their two older sisters and one young brother, the heir, Grand Duke Alexis, Maria and Anastasia were largely isolated from meeting other people, and having a well-rounded education. It is suffice to say that the five imperial children were emotionally immature and insular. But this does not mean the words of these young ladies are not important or worthy of publication. It is important to know (and read) the correspondence between the sisters and their parents and other relatives, including their aunt Grand Duchess Xenia. They are the witnesses to their own final days before the family was murdered by the Bolsheviks. After their father's abdication, their lives changed inexorably. In the first two years of the first world war, the grand duchesses were able to experience life outside the palace, visiting patients, learning how to nurse, but still seemingly oblivious to the reality of what was happening in Russia. This was a country, drained by war, on the verge of a bloody revolution, but we see little of these events in the young women's words. But what we do get is the poignancy of the final year of their life. Maria, in one letter (September 1917), writes "we live in one room all 4, so it is not lonesome. Our windows look over the street and we often look at the passers-by." There are a few hints of what was to come. In March 1918, Anastasia wrote to an unnamed friend: "For the moment, thank God, we are living well. A detachment of the Red Army men from Omsk, up until now they behaved themselves..."
In the spring of 1918, the family was briefly separated, as Olga, Tatiana, Anastasia and Alexis remained behind at Tobolsk, as Alexis had been to ill too travel, while the rest of the family was taken to Ekaterinburg. The final letters are to friends, In one, Maria writes of sending a food package, which was very generous as the Imperial family's own rations were limited. Life became more difficult when everyone was reunited in Ekaterinburg. "We miss the quiet and peaceful life in Tobolsk. Here we have unpleasant surprises almost daily. Just now the members of the regional committee were here and asked each of us how much money we had with us," Maria wrote less than two months before the family was killed. The authors have enhanced the book by including excerpts from Nicholas and Alexandra's diaries. One can feel the poignancy and the uncertainty in one of Nicholas' last entries, where he acknowledges Maria's birthday. But there were also other things on his mind: "Spent an anxious night and stayed away and dressed ...All this was because the other day we received two letters, one after the other, which informed us to get ready to be kidnapped by some loyal people! But the days passed and nothing happened, and the anticipation and uncertainty were extremely tortuous." The letters were more likely to be cruel ruses set up by their Bolshevik captors, already aware of what would happen in July 1918. As with the previous book, Russia's Last Romanovs, Maria and Anastasia could have used a good editor who might have caught a statement that got my attention right away - the first line of chapter one, where Archduke Franz Ferdinand (no hyphen) was assassinated by a Serbian terrorist. Gavrilo Prinzip was a Bosnian Serb. Big difference.